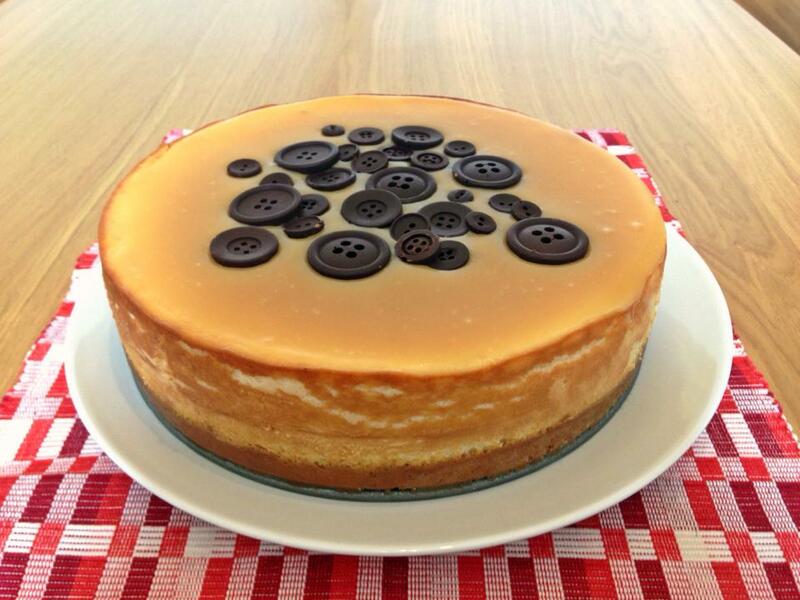 Baked cheesecake is good, really good. It is pretty simple and it always goes down well at social occasions. It is easy to adapt by adding whatever toppings you like (fruit, sauces, a pint of caramel and 16 smashed up Dime bars etc) which means it is a good thing to take to birthday parties or barbecues. 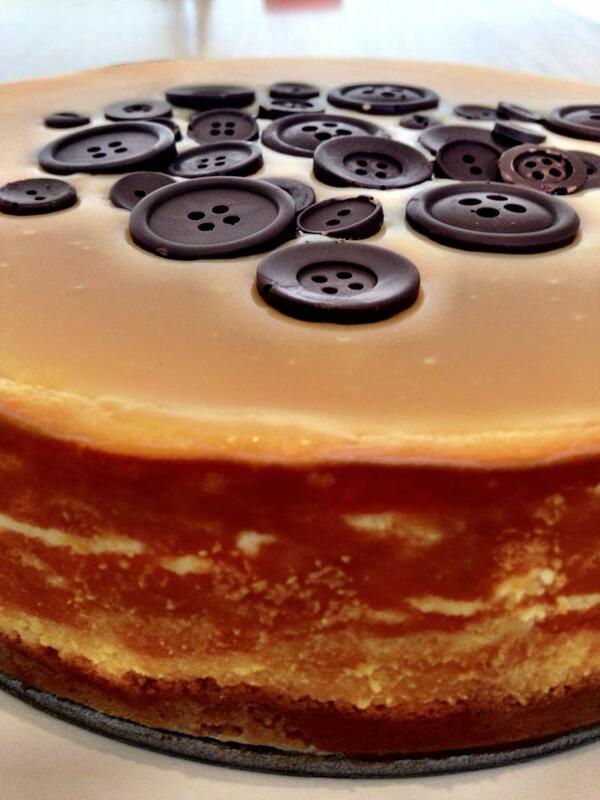 Anyway, I recently make a salted caramel and dark chocolate button one for a Eurovision Party. The recipe here is for the basic recipe but you can add whatever you like to the top. Preheat the oven to fan 170C. Cut out a circle of baking parchment and line the bottom of a 9 inch tin. This makes quite a deep cheesecake so in needs to be quite a deep tin. For the base, melt the butter in a medium pan then in the biscuit crumbs and mix until it is moist. Press the mixture into the bottom of the pan with the back of a spoon and bake for 10 minutes. Take out of the oven and cool on a wire rack while preparing the filling. Sometimes I find the base can go a bit soggy, so if you like you can use a brush of egg white before you bake it to create a bit of a barrier from the filling. For cheesecake bit turn the oven up to 220C. In a stand mixer (I use a KMix) use the paddle attachment to beat the Philly fairly slowly creamy for a minute of two. Keep the mixer running and add the sugar, then the flour making sure you scrape down the sides of your bowl a couple of times during baking. Switch the paddle attachment for the whisk and with the mixer on medium add the vanilla, lemon zest and juice. Whisk in the eggs and yolk, one at a time scraping down the bowl from time to time. Stir the soured cream and whisk until smooth. Grease the sides of the springform tin and put on a baking sheet. Pour in the filling. Bake for 10 minutes. Reduce oven temperature to 120C bake for 40 minutes more. If you gently shake the tin, the filling should have a slight wobble. Turn off the oven and leave the door closed. Allow to cool for two hours in the oven. The top may crack but don’t worry, it is a good excuse to add more topping. Put it in the fridge for least 8 hours or overnight. Those home made buttons are possibly the cutest thing ever. Beautiful.